On four occasions now at Anagrams Around Eve, the top solver of the month has cracked every puzzle but one, and on all four of those occasions, the elusive puzzle was one that eluded all solvers. Such was the case in February, whose very first puzzle — “One with superb staying power?” — was a tricky one that managed to keep everyone at bay for the entire month. Every other puzzle, however, was handled in exceptionally short order by Loving Solving of Brooklyn NY, who has been a high finisher every month from the beginning and has now taken the top prize for the first time. Kudos! 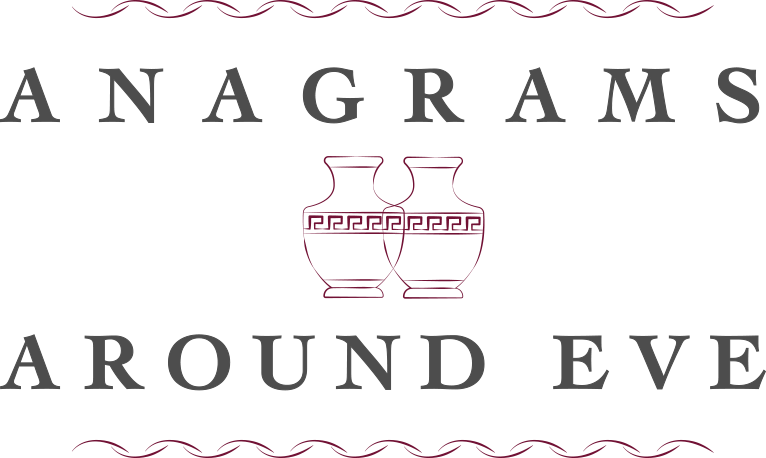 to Loving Solving, who for his impressive performance will receive an Anagrams Around Eve notepad, as well as a set of twenty Triunes, anagram puzzles with three-line solutions. Congratulations to all of these skillful and lucky solvers, and thanks to everyone who submitted solutions in February. The solutions to all February puzzles are now revealed at the original puzzle post, through a link below the puzzle. Before a few comments about the February puzzles, I wanted to share a verse puzzle from this month’s Enigma that uses a transposal pair that appeared in an Anagrams Around Eve puzzle some months ago. In the Enigma, an “overloaded” puzzle is one where either solution word can fit logically in the same place (in this case at the cueword LACE). One is a nine-letter word, the other a two-word phrase (three and six letters) which is not officially in Merriam-Webster but which nonetheless has “dictionary nature” (in other words, it is something that people these days would say is “a thing”). Feel free to send me a triumphant note when you solve it. There are spoilers ahead, for anyone still working on the February puzzles . . . When sending in the solution to “Robots in Star Wars with seedy intentions” (SORDID DROIDS), MISS SORTED (homonym of “sordid”!) appended the charmingly apt message: This is the anagram you’re looking for. When I first wrote that puzzle, I had used a different clue: “Robots such as those appearing in the famous cantina scene in Star Wars.” I thought it was perfect, because the reference to the cantina — so memorable as the epitome of seediness — would alone do the work of cluing the “sordid” part of the answer. Good thing I loved that scene so much as a kid that after writing the puzzle I wanted to watch the clip for old time’s sake, because the gruff bartender quickly reminded me that droids weren’t even allowed in the cantina (“We don’t serve their kind here!”). Loving Solving was the only loving solver to come up with RELIEVING INVEIGLER for “One whose wheedling strategy is to lighten the other’s load.” If there were six-jug puzzles, this would have been one. Even on turning to Google or a dictionary or thesaurus, you’re not likely to encounter “inveigler” directly but would have to infer it . . . an impossibly rare noun form for an already rarely used verb. BONSOIR ORBISON was evidently a favorite of many a solver, and it was a favorite of the constructor too. I’m not sure how noticeable this may have been, but as a further tribute to that bold and beautiful spirit, I did use only jet black in the design of his puzzle.